Trying to talk to Raymond Blanc and Hugh Fearnley-Whittingstall about the future of food is like chasing two runaway horses. Both chefs are so passionate about “the most serious issue we face on the planet”, according to Fearnley-Whittingstall, that I have to wait a good while to get in a question. 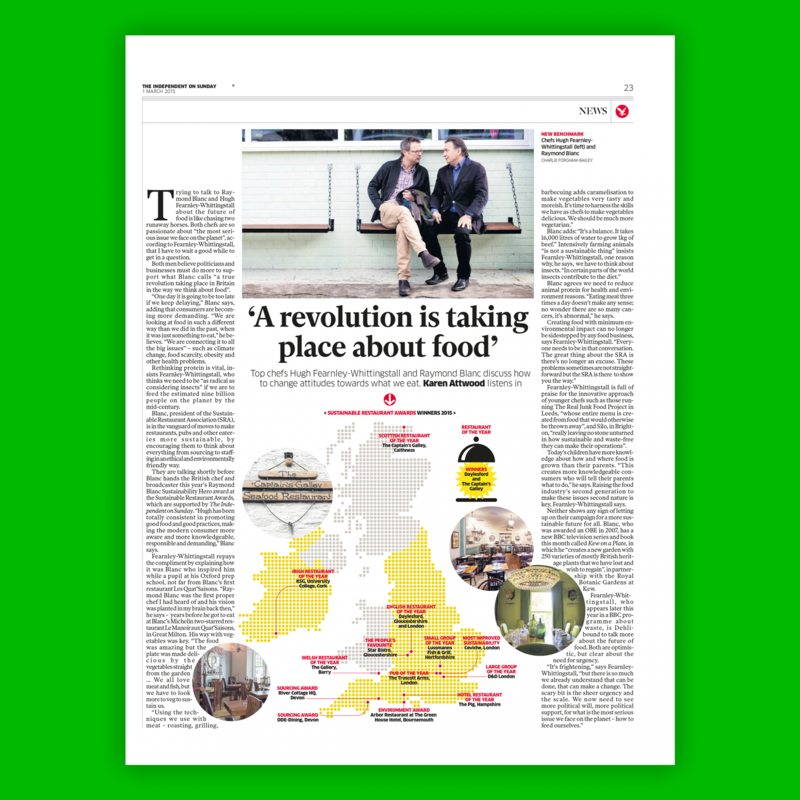 Both men believe politicians and businesses must do more to support what Blanc calls “a true revolution taking place in Britain in the way we think about food”. “One day it is going to be too late if we keep delaying,” Blanc says, adding that consumers are becoming more demanding. “We are looking at food in such a different way than we did in the past, when it was just something to eat,” he believes. “We are connecting it to all the big issues” – such as climate change, food scarcity, obesity and other health problems. Rethinking protein is vital, insists Fearnley-Whittingstall, who thinks we need to be “as radical as considering insects” if we are to feed the estimated nine billion people on the planet by the mid-century. Blanc, president of the Sustainable Restaurant Association (SRA), is in the vanguard of moves to make restaurants, pubs and other eateries more sustainable, by encouraging them to think about everything from sourcing to staffing in an ethical and environmentally friendly way. They are talking shortly before Blanc hands the British chef and broadcaster this year’s Raymond Blanc Sustainability Hero award at the Sustainable Restaurant Awards, which are supported by The Independent on Sunday. “Hugh has been totally consistent in promoting good food and good practices, making the modern consumer more aware and more knowledgeable, responsible and demanding,” Blanc says. Fearnley-Whittingstall repays the compliment by explaining how it was Blanc who inspired him while a pupil at his Oxford prep school, not far from Blanc’s first restaurant Les Quat’Saisons. “Raymond Blanc was the first proper chef I had heard of and his vision was planted in my brain back then,” he says – years before he got to eat at Blanc’s Michelin two-starred restaurant Le Manoir aux Quat’Saisons, in Great Milton. His way with vegetables was key. “The food was amazing but the plate was made delicious by the vegetables straight from the garden… We all love meat and fish, but we have to look more to veg to sustain us. Blanc agrees we need to reduce animal protein for health and environment reasons. “Eating meat three times a day doesn’t make any sense; no wonder there are so many cancers, it’s abnormal,” he says. Fearnley-Whittingstall is full of praise for the innovative approach of younger chefs such as those running The Real Junk Food Project in Leeds, “whose entire menu is created from food that would otherwise be thrown away”, and Silo, in Brighton, “really leaving no stone unturned in how sustainable and waste-free they can make their operations”. Today’s children have more knowledge about how and where food is grown than their parents. “This creates more knowledgeable consumers who will tell their parents what to do,” he says. Raising the food industry’s second generation to make these issues second nature is key, Fearnley-Whittingstall says. Neither shows any sign of letting up on their campaign for a more sustainable future for all. Blanc, who was awarded an OBE in 2007, has a new BBC television series and book this month called Kew on a Plate, in which he “creates a new garden with 250 varieties of mostly British heritage plants that we have lost and wish to regain”, in partnership with the Royal Botanic Gardens at Kew. Fearnley-Whittingstall, who appears later this year in a BBC programme about waste, is Dehli-bound to talk more about the future of food. Both are optimistic, but clear about the need for urgency.